Become root on License Dispatcher server. It may take several minutes! When the license dispatcher reports that it is now accepting queries, users may begin working with EasyCopy. If you are installing the password (license key) on the license server, the password installation procedure will automatically run instsrv.bat, which will install ecdaemon as a service. Running instsrv.bat will automatically stop and restart ecdaemon. You can also run ecdaemon stop and ecdaemon start on Windows in a command prompt window as you can run assign if you want to assign or unassign fixed licenses. Again it may take several minutes! When the license dispatcher status reports that it is now accepting queries, users may begin working with EasyCopy. 1) Is this a new issue in an installation, that has been working up till now? 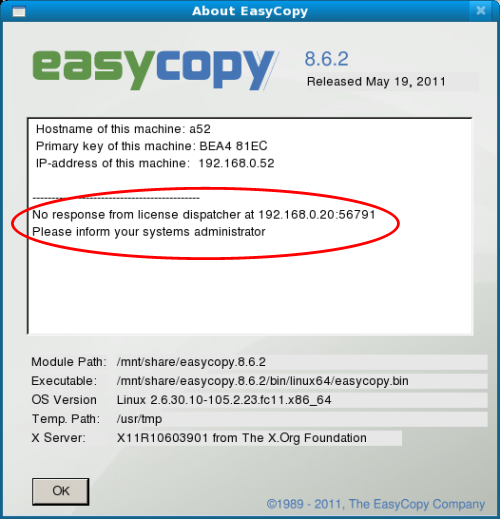 2) Can the client ping the IP address of the Easycopy license server? 3) Is there a (new or reconfigured) firewall between the clients and the Easycopy license server. 4) EasyCopy has a program 'eclic'. Does that program give a 'good' answer when called from the license server . If yes: Does it also give a good answer, when called from the clients. (eclic tries to connect to port 56791 on the Easycopy license server). 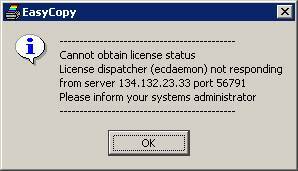 5) Can you see an 'ecdaemon' process on the Easycopy license server. If not: Try to start it as root from a terminal window 'ecdaemon start'. Either it should give you an error message OR after a minute or two it should say 'Ready to answer querries...'. 7) If all of the above does not help: Please go to <EasyCopyDir> on the Easycopy license server and do 'ecinfo'. That will produce a dump file, which will show most of the settings relevant to EasyCopy. Please also do the same thing on a failing client.